I couldn’t resist this little fellow. I don’t know how old he is or where he came from, with absolute certainty, though the seller suggested that he had come from the Black Forest. That seems quite likely given the quality of the work and the fact that it appears to be made from lime wood, which was much used in Germany. 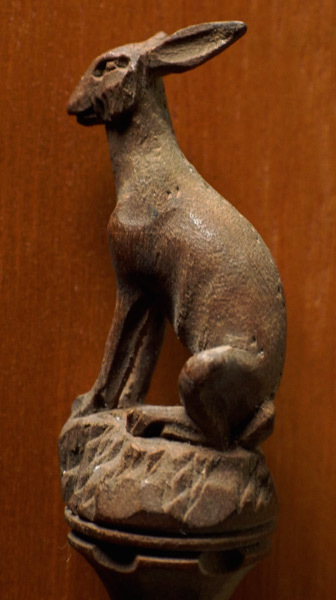 I’ve checked my various reference works and I see nothing else with a carved wood animal finial. There is not a lot I can say about this object. It’s not perfect – much of the ear away from the camera has been lost. That’s a pity but it doesn’t affect the function and it barely affects the aesthetics. It’s my guess that the part that the nib goes in is bone rather than ivory. So far as I can, given that I can’t write with a dip pen, I’ve tried it and it seems perfectly practical. Wonderful – where do you find these things? As for using dip pens – of course I used them at prep school, but recently I bought a box of pre-war nibs on ebay and tried one out in a penholder I have here (nothing like the one illustrated above!). I don’t understand the thing: I’m sure when I was young, one could write a couple of words or so on a dip. I’m lucky to get a couple of letters! Perhaps I need a bottle of genuine 1950s school black sludge? Where do I find them? I devote my life to finding writing instruments! Few weeks back when I saw the porcelain dip pen you bought I was really impressed with its beauty and I thought you could not better it. Well this is a different beauty and this penholder must have taken a lot of time and love to carve such a small figure. I love them. You are indeed someone full of great surprises. Thank you for sharing them with us and please keep on surprising us.